Today Eli is wearing his fisherman outfit. I LOVE these dungarees that my sister got for him, they are so cosy and natural pure wool so keep him at a good temperature and let his body breath. Underneath is a hand knitted jumper hand me down and some cosy wool socks. His dungarees were from http://www.cambridgebaby.co.uk/catalog/ which has lots of beautiful natural and organic baby wear. the brand is disana http://www.disana.de look like a very nice family run german company.I will be buying more from here! 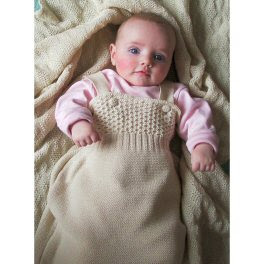 look at this lovely cosy sleep bag they do. The fisherman outfit looks wonderfuly warm. What I noticed is that the trend for Customised baby wear is to make it personalized. Gone are the days when people give "generic" gifts. Now, you'll see much more effort in having it customized even if it means going the extra mile.